In the first progression, player 1 passes to player 2, who comes toward the ball and receives the ball across their body onto the back foot. Their first touch allows them to play the pass to player 3 at speed. 3A should receive the ball on their right foot. Player 3B should receive the ball on their left foot. They should take a positive first touch in order to run at speed and then go the end of the line. Each player follows their pass. Message in the pass. Be accurate and play at game speed. Your first touch should allow you to receive and pass in a mobile, fluid motion. Receive the ball and be able to accelerate at speed. Stress the importance of receiving the ball and being able to shield and play quickly and move to space. The player and grid setup are the same as the initial phase. Player 1 passes the ball to player 2 who now returns a setup pass. Player 1 plays the ball first time to player 3, who takes a positive first touch to travel at speed to the end of the line. Player rotation is still the same. Player 2 must show for the ball correctly while shielding and must play the ball with the appropriate foot. The left line (A) will play with the right foot and the right line (B) will play with the left foot. Try to build to game speed. Progress to one touch passing throughout the exercise. To progress to the next stage, player 2 now angles and times their run in order to play a wall pass with player 3. Player 2 must time their run and approach at the proper angle in order to play effectively and at speed. Player 2 must open up their body position in order to play the pass on the proper foot. Player 3 must receive the ball on the proper foot in order to go forward at speed. 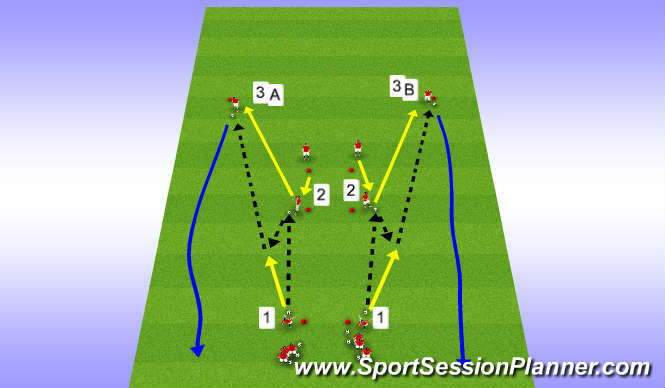 Players 1 and 2 play the set up pass to player 3A. The ball is now played back to player 2, who has a taken a more central triangular position between players 3A and 3B. 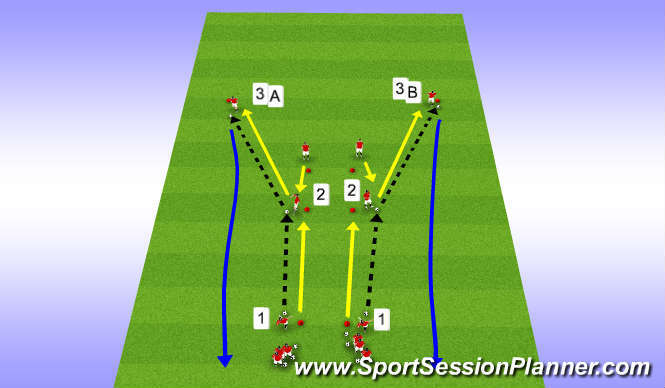 Player 2 plays the ball across to 3B who receives and travels forward at speed to the end of the line. Both lines will participate. Stagger the starting time so that both sides are allowed to play effectively and the players do not get into each other&apos;s way. Timing of the runs is essential in order to play at speed. Play the ball first time as much as possible. Basically we have just added a wall pass between players 2 and 3B. You can add two goals or a more centralized goal for added incentive. Just keep in mind what the theme of your session exercises are. The quality and accuracy of the passes must constantly be stressed. The timing of the runs are vital for the success of playing at a high tempo.